The Salesforce integration lets you create leads and contacts from chats, archives, and the Visitor section at a good clip. Easily search the Salesforce contacts directly from LiveChat as well as save chat transcripts as Cases or Objects in your Salesforce account. You can finally spend more time talking with your customers and less managing contact data. Salesforce Sales Cloud is a platform for managing a sales team and customer relationships. It lets you map out each step of your sales pipeline. With this software, you can have a complete view of your customers, including contact information, the actual stage in the pipeline, quotes, the history of interactions as well as internal notes. You are able to gain insights from social media sites such as Linkedin, Twitter or Facebook - right within Salesforce. What's more, Salesforce helps you boost productivity by using workflows, which automate your business process. For example, you can automatically assign leads with deals over a certain size to a specific salesperson. Plus, you can forecast sales, analyze the performance of the sales team and make data-driven decisions. 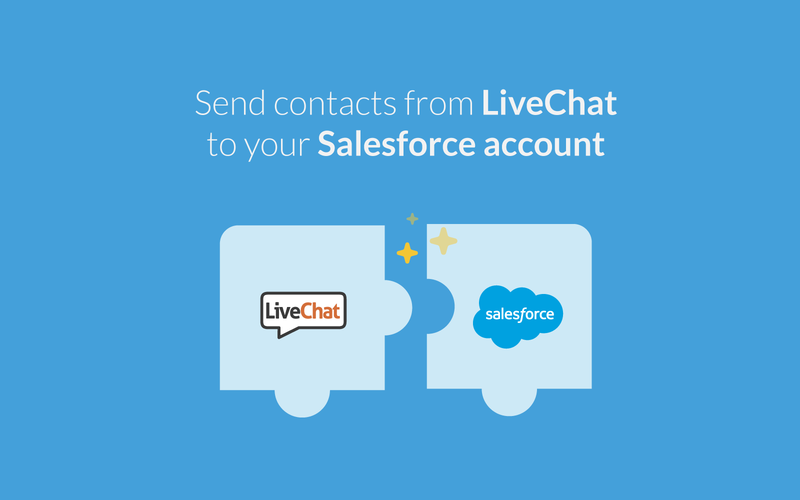 Integrate LiveChat with Salesforce and elevate your workflow to the next level. Manage your Leads and Contacts, save chat transcripts as Objects and decide which information about your customers is the most important – all of that without leaving your LiveChat application! Decide which fields should be available when adding new Leads or Contacts and and choose the exact object to which LiveChat will save your chat transcripts – whether it's the Activity or Task. And all of that straight inside the plugin itself. The context gained from CRM records is key for sales and support teams as they chat live with prospects. This integration provides that context right where they work - in the Salesforce dashboard. Start using LiveChat with Salesforce now!